TrueGivers & NeonCRM Integration - read all of the details here. This week we are proud to announce a direct integration between TrueGivers and NeonCRM. The timing couldn’t be better — this integration will make sure all your year-end appeals and follow-ups are actually delivered to your donors. Plus… you’ll find new data that can add even more to your bottom line. CASS/DPV - All of your addresses will be hygiened to comply with USPS standards. NCOA (National Change of Address) - All of your names and addresses will be processed against the USPS NCOA 18/48 month update file. New addresses will be added and old addresses will be archived. RDI (Residential Delivery Indicator) - All of your addresses will be flagged to indicate if the delivery address is a residence or commercial location. Vacancy & Other Address Services - All of your addresses will be flagged to indicate if the delivery address is mailable. Deceased - Any deceased individuals or households will be flagged with a confidence, date, and deceased link. Individual & Household Data Enhancements - Individual and household records will be enhanced with third-party and curated data. We're always adding new ones, so be sure to check the data dictionary. The integration automates data stewardship by correcting addresses, marking deceased donors, and adding critical information like age, income and other essential information. Now these basic but all-important tasks can be performed automatically and inexpensively. 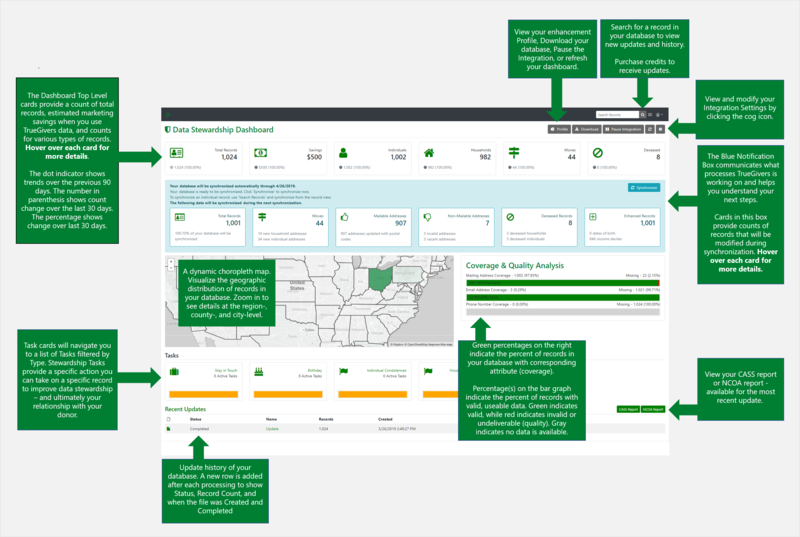 We create a dashboard that shows a high-level analysis of your file and helps you evaluate your organization's data health. 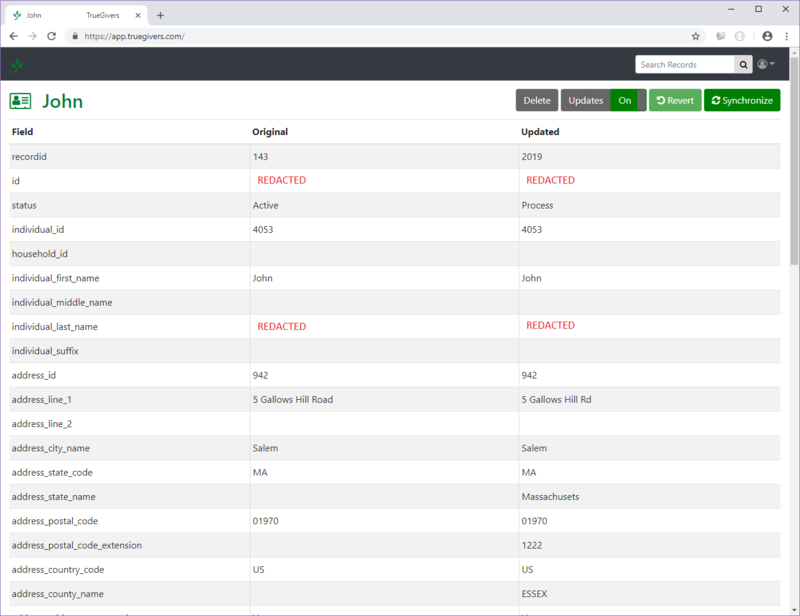 In mere minutes, we'll finish a full scan and update records in your database with current addresses, deceased information, and Real Estate & Individual Data Enhancements. You can also use the search feature to see data updates at the individual record level. Just search for your donor by name and you’ll see a side-by-side comparison of what the record looked like before and after you integrated with TrueGivers. Continue reading to learn more about how the TrueGivers Data Hygiene & Enhancement Service can help your organization. As non-profits become more reliant on data to make decisions, we face a growing challenge known as data stewardship. By this, we mean using data services to correct addresses, mark deceased donors, and add critical information like age, income and other essentials. CRMs and other technology solutions provide an invaluable asset: a place to store data. When your database is full of low quality, incomplete, outdated, or just plain wrong data, it's not serving you. But it can be challenging to understand how your data health is impacting your success. That's why data stewardship is so important. Good data stewardship makes it easy to answer big questions about data health. There's good news: you aren't alone in practicing good data stewardship. Sustainable data stewardship depends on collaboration and mutual understanding between Applications (tools and services), Developers (the "makers"), and Organizations (that's you!) Technology partners like TrueGivers have tools in place to help you assess your data health and to also think of smarter questions to ask. Moving to a new address is a big deal. No matter how much a donor loves your mission and impact, they are not very likely to proactively inform you that they have a new address. NCOA services provide new addresses after they relocate. Plus flags undeliverable, invalid, and vacant addresses. The U.S. Census Bureau estimates that 12% of Americans move every year. The result for non-profits? Wasted money. Lost revenue. Lost donors. This is senseless waste. To add insult to injury most organizations pay far too much for this basic service. That’s one reason why TrueGivers provides a highly accurate and very low-cost automatic system for NeonCRM users. When your mail list contains accurate, mailable addresses more of your direct mail pieces make it to their intended recipient. This leads to less waste and a higher ratio of mail getting to the right person - which is exactly what you want when improving your delivery rates. This supports your organization from top to bottom, and helps you move relationships forward during qualification, acquisition, solicitation, and stewardship. Over 2 million people pass away each year in the United States. Knowing if or when a donor, or a member of the donor’s household, has passed away is critical to managing your organization’s relationships. Even for the most sophisticated and well-resourced shops, keeping up with obituaries and other sources of deceased information is a time-consuming challenge. Often the information slips through the cracks. When this occurs the chances of upsetting, offending and disappointing families are endless. Having a notice of a death can trigger a significant stewardship opportunity through expressing your gratitude for the deceased and their support over the years. There may even be an opportunity for the family to honor the deceased. Regardless of the channel, avoiding insensitive communication with your donors and constituents is important. Respectful communication can create future stewardship opportunities. Segmentation helps you create tailored, memorable experiences for your donors that build relationships. They make donors feel welcome, and like you still need their help. Interest in specific program or responsiveness to a particular message can be influenced by many factors. The ability to determine the presence of children, for example, combined with other demographic information can allow you to properly segment your prospects or donors and tailor your message. An age append alone can help you better target planned giving prospects. Customizing your outreach based on multiple attributes ensures that your efforts are as effective as possible. This new integration is designed to not only improve your immediate fundraising results, it also helps you retain donors and other important contacts. Donor retention is a key element of any fundraising program. This new integration has been designed to make regular, meaningful contact with your donors easier, more cost-efficient, and far more effective. Whether you prioritized data stewardship from the start, or you are re-prioritizing it now, this has lasting implications for how you can be an effective fundraiser and a responsible steward to improve your outreach outcomes. 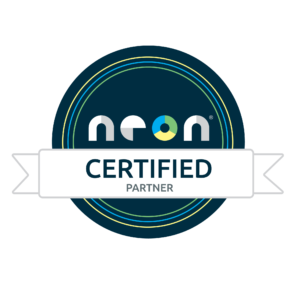 Are you an existing NeonCRM customer? Register to start your integration between TrueGivers and NeonCRM, and keep your database updated automatically! Not a NeonCRM User? Sign up today! Request a Free Trial and Demonstration to try NeonCRM!